LRT Sports founder and president Keirsten Sires offers calming advice on the recruiting front in this episode of 'Making the Jump' podcast with Steve Montoya. National Signing Day has come and gone and you didn't sign on the dotted line. Keirsten Sires, founder and CEO of LRT Sports, offers one very simple and vital piece of advice. "Don't panic," she said. "You are not the first to not sign on National Signing Day and you won't be the last. There are still plenty of opportunities out there for you." Sires said she and her company are there to help. 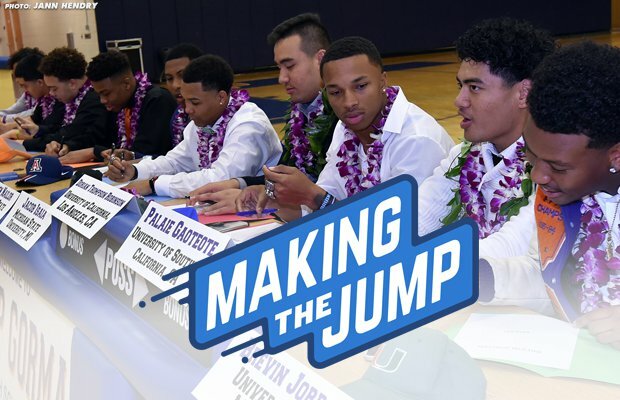 She offered a ton of suggestions and hints during the stressful period leading up to and after National Signing Day, during a 30-minute discussion with MaxPreps host Steve Montoya in the second episode of the "Making the Jump" podcast. Baker Mayfield, the No. 1 pick in the 2018 NFL draft and a walk-on at Texas Tech, is a perfect example of an athlete who took a different path in the recruiting process. The Lake Travis (Austin, Texas) standout quarterback had huge high school numbers, but his college offers were relatively small — from Rice, Florida Atlantic and New Mexico — so he didn't sign at all. The decision to stay strong and poised worked out pretty well for Mayfield, the 2017 Heisman Trophy winner who is now the starting quarterback for the Cleveland Browns. "The main thing is to stay calm and not panic throughout the process," she said. "Researching is the key. And don't be scared to put yourself out there." Click to visit the LRT Sports website. Sires, a former tennis and soccer athlete at Skidmore College in New York, said it's her company's mission to educate athletes through first-hand information and experiences. LRT Sports is a rating and review site for college coaches, and an informational site. Sires said her team takes pride in helping thousands of high school athletes be best prepared for making one of the most crucial decisions of his or her life — playing college sports. Sires and Montoya cover numerous topics including what it's like to be a walk-on in college and why going the junior college route can be a very good option. "It's important to be utterly transparent, whether you are a coach, parent or player," she said. "Always step back and consider all your options. And be realistic."